Tissue section from a HER2 positive breast carcinoma stained by ImmunoFISH reveals extensive intratumor heterogeneity. Image by I. H. Rye/H. Russnes. 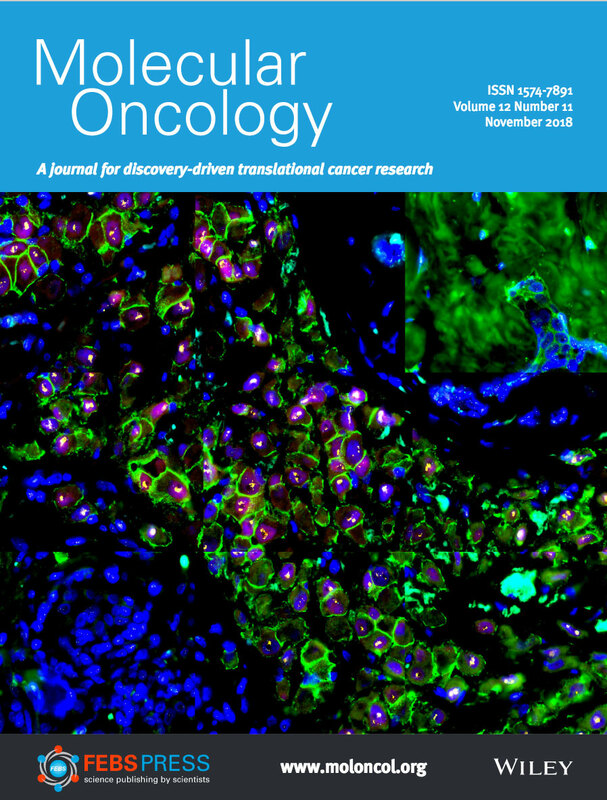 The latest issue of Molecular Oncology features an ImmunoFISH image from the article “Intratumor heterogeneity defines treatment resistant HER2+ breast tumors”, as their cover image. In the article published in the same issue Inga H. Rye, post doc in the Russnes group, combined immunofluorescence and in situ hybridization (ImmunoFISH) on tissue sections and analyzed more than 13 000 single tumor cells from 37 HER2+ breast tumors. 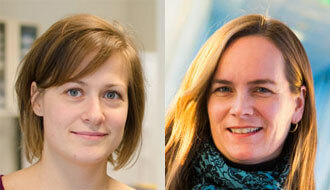 By a validated computational approach previously developed by the group (GoIFISH, Trinh et al. Genome Biology 2016), they found a subset of HER2+ breast carcinomas to exhibit substantial heterogeneity with regard to HER2 protein expression, HER2 gene copy number alteration, and estrogen receptor protein expression. The heterogeneity was both between cases but also within cases (inter‐ and intratumor heterogeneity). Highly heterogeneous tumors were associated with significantly shorter disease‐free survival and fewer long‐term survivors. This shows the potential impact addressing cell‐to‐cell variation can have in a clinical setting. Both this work and the previous paper from the group describing the computational approach are the results from a close collaboration with the Markowetz group in Cambridge. Rye IH, Trinh A, Saetersdal AB, Nebdal D, Lingjaerde OC, Almendro V, Polyak K, Børresen-Dale AL, Helland Å, Markowetz F, Russnes HG. Mol Oncol. 2018 Nov;12(11):1838-1855. doi: 10.1002/1878-0261.12375. GoIFISH: a system for the quantification of single cell heterogeneity from IFISH images. Trinh A, Rye IH, Almendro V, Helland A, Russnes HG, Markowetz F.
Genome Biol. 2014 Aug 26;15(8):442. doi: 10.1186/s13059-014-0442-y.